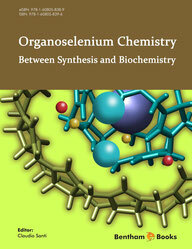 “Organoselenium Chemistry:Between Synthesis and Biochemistry” , Bentham (2014) C. Santi Ed. C. Santi*, C. Tidei “Addition reaction for the formation of C-S and C-Se bond” in Comprehensive Organic Synthesis, Elsevier (2014) 2nd Ed. C. Santi* in Science of Synthesis vol. 39- (2013) Thieme: 39.18.2 Alkaneselenols, 391-405. C. Santi* in Science of Synthesis vol. 39- (2013) Thieme: 39.19.1.2 Acyclic Alkaneselenolates, 407-425.